Cats, dogs and rabbits, as well as most species, have a left and right mandible. They join together in most domestic animals as a mandibular symphysis. In humans, the area the mandibles join together is a bony union. In the cat, dog and rabbit, the symphysis of the mandibles is a fibrous union. Mandibulectomy is a surgical procedure where a segment of the mandible, or the entire mandible is removed. Segmental mandibulectomy can also be performed bilaterally (on both sides) to include the entire symphysis. Mandibulectomy cannot be performed for rabbits due to their unique dentition. Dr. Kressin has managed many cases of mandibulectomy for dogs and cats. Mandibulectomy is typically life saving and extremely well tolerated for pets with appropriate case selection. Early treatment is always preferred. Mandibulectomy relieves pain and discomfort associated with oral tumors because it removes the source of pain. The recovery period is typically very short (~12 to 72 hours) and animal owners are often extremely surprised to see how quickly their pets return to normal activity. Many patients immediately feel and act better than before their surgery. The tongue will often protrude from the mouth after the mandibulectomy procedure; however, most of the patients learn to retract the tongue into the mouth in a normal position within a few weeks. Increased salivation may be noticed. Occasionally, there is a "clicking sound" when the dogs chew food due to drift of the other mandible resulting in teeth bumping into other teeth. This drift can cause soft tissue (palatal) occlusal trauma. Additionally, during ther immediate post operative period, some animals make a mess with food and water. Most of these problems resolve with or without additional treatments. 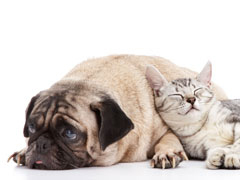 Overall, the results of surgery are highly favorable for both the pets and their owners. The most common reasons for performing mandibulectomy are: oral tumors, facial skin tumors, mandibular fractures, non-union healing of fractures, infection or necrotic local tissues. Please feel free to call for a consultation with Dr. Kressin! Fibrosarcoma of the left mandible. 2.5 cm x 2.2 cm x 1.2cm involving the skin and underlying tissues. surgical defect in a tension free manner with optimal cosmesis (appearance). Post-operative left lateral (side) and ventral (underside) views. Two week follow-up visit. At this time skin sutures were removed.